Gertrude Chandler Warner | "A Stitch in Time"
Now we are slow to post but relatively quick to read. This was the case with The Lighthouse Mystery by Gertrude Chandler Warner, the 8th in the Boxcar Children series. We actually had to go digital with this one, which seems to add to the struggle. I think both Gavin and myself prefer the personal touch of a paperback book over a kindle in hand. I found this mystery did a lot more foreshadowing than any of the others. Which was a definite change from the previous. The kids have also grown up. The oldest brother now is in college during the school year and the children all a little older. I do like the progression. You really SHOULD read these books in order to ensure you don’t end up ruining previous mysteries. I love how the main goal of this family is to make themselves and everyone around them happy… there is always some wish of improvement or some person of interest they just want to help. The mystery is interesting, the kids funny as usual and grandfather absolutely well connected and wealthy… But that is enough from me… here is Gavin! Beware of potential spoilers. 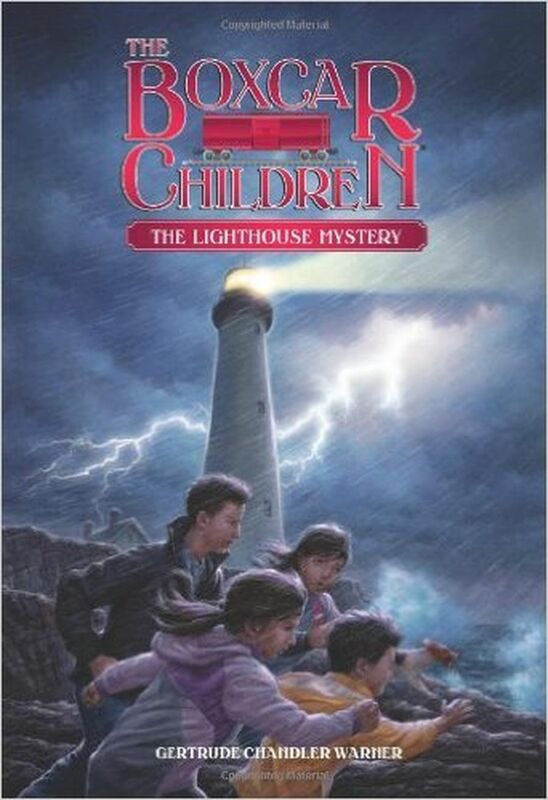 I like that they were able to rent and go live in a lighthouse. I like that the dog had a huge part in solving the mystery. And that they met a lot of new characters. My favourite part was that the dog kept barking, it was funny. I liked this mystery better than all of the other books EXCEPT FOR the first book. I like that there was a dangerous rescue. It was an awesome book! I think that anyone, especially kids could read it and have fun. And there you have it… 11 year old’s genuine opinion shared! Seriously though, I feel like this is a series for most anyone. Especially if you are reading with a child! So check them out (in order preferably). Back to our little book club of 2 and the reviews we come up with together. 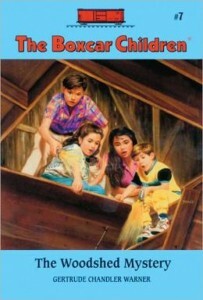 We have made it to book 7 of the Boxcar Children series by Gertrude Chandler Warner: The Woodshed Mystery. I have to say from a strictly entertainment value review, this is the best book of the series. There are multiple mysteries, interesting new characters and some background/history on the beloved Aunt Jane unearthed. I also found it interesting that the author had the children grow up some as well… they have progressed in age and grade and even attitudes. It is even more apparent in this book that we are required to read the previous books in order to truly understand who is involved. I love how dated these are. There are no cellphones, no internet… the mysteries are solved by hard work, talking to the neighbours and coming to careful conclusions. It was a wonderful read and fun to share with my fellow book club member. And now for Gavin’s impressions beware of potential spoilers! I loved the mystery in this one because it was very interesting. They solved 3 or 4 mysteries this time! They have meet a lot of friends in these books and some that they thought were dead! I think the dog should be in everything more. I think this is the best bet yet in the series. It is a good story to read to children and homeschooling kids would like it. I want to read the whole series, maybe. There are a lot of books! And there you have it, another Boxcar Children book borrowed from the library and thoroughly enjoyed! Again, be forewarned, READ THEM IN ORDER! That is the only way to be in the know when past events are recalled or people. A light afternoon read for myself or an intriguing mystery for Gavin, we both truly enjoyed this story. 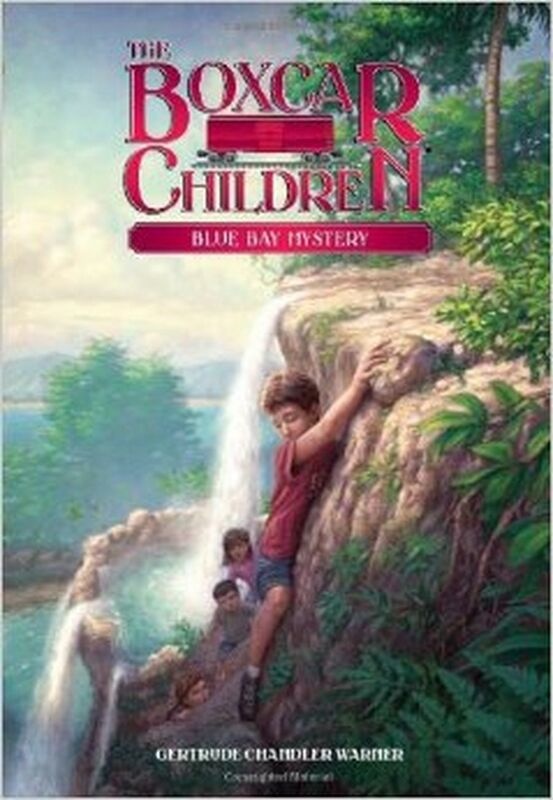 After a bit of a website issue which has now been resolved (fingers crossed) here we are with a long awaited book review from our mini book club of two… Gavin and I have finished the 6th book in Gertrude Chandler Warner’s Boxcar Children….. Blue Bay Mystery. 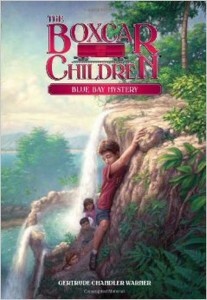 The Blue Bay Mystery has uprooted the children once again for an exotic location, this time with Grandpa in tow! I have to say… the man is creative at keeping his kids busy. There was a wonderful section on a large ship where the kids school as they travel. (I may be a bit biased on that one). I found this to be a super quick read for myself, not so for Gavin. But I enjoyed my few hours of escape into the world of the Boxcar Children. An unusual adventure with a bit of a mystery, be prepared to suspend adult disbelief and enjoy the coincidences and favourable circumstances. I think we are on total agreement, Gavin and I, read these in order or risk spoiling characters and events! And now for Gavin! Beware! He can spoil! This book had some new friends and an old friend. I like that there was a jungle but I wish there had been monkeys. I wish they had not ended the book so quickly, I wanted to know more of what happened when they got back. I missed the dog because he wasn’t there. I still want to read every book! So there you have it! A ringing endorsement from a boy who believes that everyone should read this series (or be read to)!